When thinking about the mountains where we live, the quote “The only thing that is constant is change” (Heraclitus), comes to mind. A few nights ago, I noted a heavy fog, and when I raised the shade in the bedroom the next morning I was greeted with a winter wonderland. Rime ice had coated every surface on our property. I quickly dressed to go for my “run, walk, hike” on our road before the sun melted the delicate art. 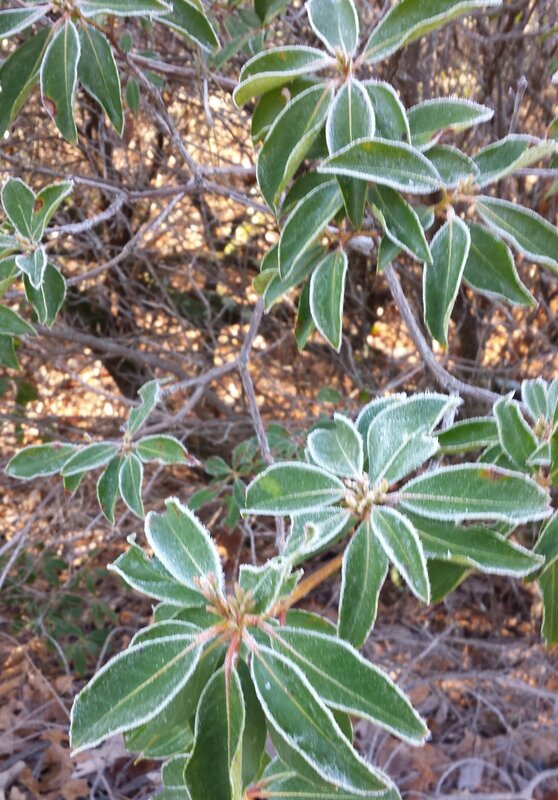 I stopped on my way up the mountain to take a photo of Mountain Laurel on the edge of the road whose leaf edges were rimmed in ice. A Holly on our property looked as if its leaves had been frosted. Our Fraser Fir Christmas tree still looked so fresh when we removed the ornaments that we placed it into and old hollow tree stump, and it too, had some beautiful icing. In a matter of hours the ice was gone, but what a joy to have photos to remember that beautiful morning on our mountain!